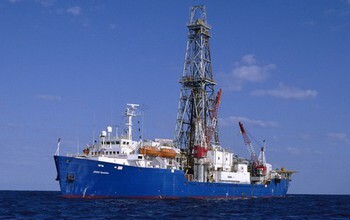 On its current expedition, the drilling ship JOIDES Resolution is working off the coast of New Zealand. Credit: International Ocean Discovery Program (IODP). A mission to study New Zealand’s largest fault by lowering two sub-seafloor observatories into the Hikurangi subduction zone is underway this week. “This expedition will yield information that’s key to understanding why destructive tsunamis happen after shallow earthquakes and after underwater landslides,” says James Allan, a program director in NSF’s Division of Ocean Sciences, which funds IODP. This is the second of two related expeditions aboard the scientific drilling ship JOIDES Resolution, and is aimed at studying the Hikurangi subduction zone to find out more about New Zealand’s largest earthquake and tsunami hazard. The voyage’s international science team will sample and analyze cores from below the seabed to understand the rock properties and conditions where these events occur. “We don’t yet understand the slow-slip processes that cause faults to behave in this way, and we don’t know very much about their relationship to large subduction zone earthquakes,” says expedition co-leader Demian Saffer of PennState. 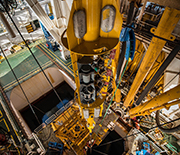 Instruments are lowered to the ocean floor on an IODP expedition. 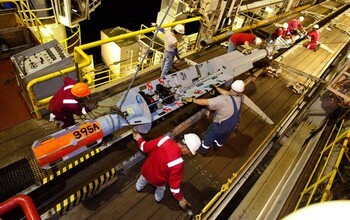 Credit: IODP. IODP scientists and engineers ready instruments for an expedition. Credit: IODP. 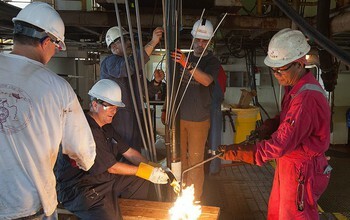 Scientists on an IODP expedition work on instruments before lowering them to the sea floor. Credit: IODP. Last year’s Kaikôura earthquake triggered a large slow-slip event off New Zealand’s east coast that covered an area of more than 15,000 square kilometers (5,792 square miles). The event started near the current planned IODP expedition; results from this research should shed new light on why it occurred.